In 2015, the 25th edition of Signatures from Big Sky will be published, showcasing artwork and writing by Montana students. In past years, students' works have also been published in the Montana energy calendar and displayed in the state capitol rotunda. To have your work considered for publication, it must be submitted by February 14th, 2015 to one of the regional reviewers. Student writers may submit original short stories (1 to 3 typed pages), poems or essays. Artists should submit 8 1/2" x 11" artwork or photos for reproduction in black & white or color. 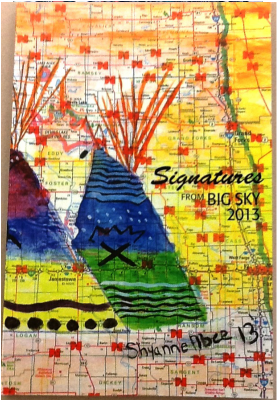 Detailed instructions on how to submit your creations are published each fall on the Signatures from Big Sky website. Flyers will be sent in October/November to all schools and posters will be mailed to all school libraries. School libraries have received copies of past editions. Signatures from Big Sky is published by Montana Association of Gifted and Talented Education (AGATE), Montana Association of Teachers of English/Language Arts, Montana Art Education Association, Montana Arts Council, and the National Endowment for the Arts.